Beautiful bells, a few mildly hot peppers, and this seasons best surprise pepper. Chocolate peppers, named for their color, will go from a chocolate brown and turn green when cooked. It’s October. The cooler weather is producing more peppers. A little rain could only help. Several loaded branches of the pepper plants have snapped with the weight of this year’s crop. The heavy foliage protects the pepper from sunburn. We grow peppers to freeze and use all winter in stew, chili, fajitas and soup. Chopped or cut into strips, bell peppers are easy to freeze. A couple of trays of stuffed peppers are already in the freezer ready for quick winter meals. Some of the prettiest bells were the Sweet Purple Beauty, Sweet Cal Wonder and Sweet Chocolate**. Sweet Cal Wonder is the one pepper that should always be in a small space home garden, the thick-walled and juicy bright green bell turns red when ripe. Padron chile peppers, Pimientos de Padron*, are the summer’s best garden discovery. My only regret was not growing more of these 1″ to 1-1/2″ surprise peppers. They are delicious. Except maybe 1 out of every 10 is hot. These peppers are bright green to yellowish-green and best picked small. Size or color is not an indicator of heat. The Padron peppers are a tapas bar and restaurant favorite throughout Spain. Padron chile peppers, Pimientos de Padron, are an heirloom non-hybrid variety of chile. Let one or two peppers continue to grow and save some seed for next year. Picked small, then blistered in a hot, oiled skillet, and finally, salted. They are the perfect appetizer, or tappa. Once charred, peppers easily peel apart from the skin. The poblano (Capsicum annuum) is a mild Mexican chili pepper. Dried, it is called ancho or chile ancho. Anaheim and poblano peppers are first roasted then peeled. These chilies are finely chopped and frozen into cubes for easy storage. To use, drop the frozen peppers into what ever dish you are cooking. You can exchange these peppers for each other in recipes. A poblano chili ages to brown and has an earthier, almost smoky flavor. When dried, it becomes the ancho pepper with a smoky sweet taste. The green California Anaheim becomes sweeter as it ages to red. Pick at any stage. These are the pepper I use in salsa. I mix the colors in my salsa, using what ever is available at canning time. * The Tapas Peppers,Spanish Padron are from Renee’s Garden and started from seed. If you haven’t grown petunias in a while, look again. These Proven Winners bloom continuously with no need for deadheading. 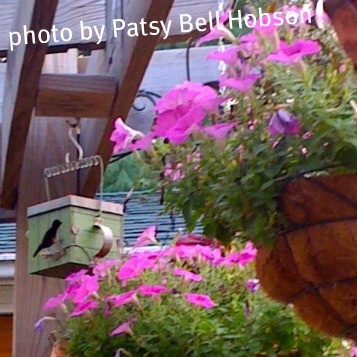 Hummingbirds stopped by daily. Butterflies and birds love these flowers. 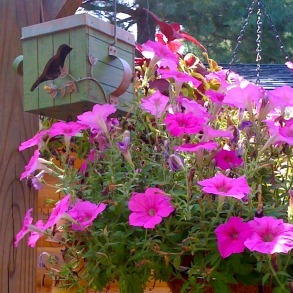 Giant Pink Petunias are heat and drought tolerant. To survive in my garden, flowers need to be care free and low maintenance. My opinion of petunias has changed. I love these bright pink annuals. It was my pleasure to trial these plants for Proven Winners last summer. Proven Winners are easy to find in our area. You could imagine my shock when I read the back of the plant label this spring: “BUY THIS! 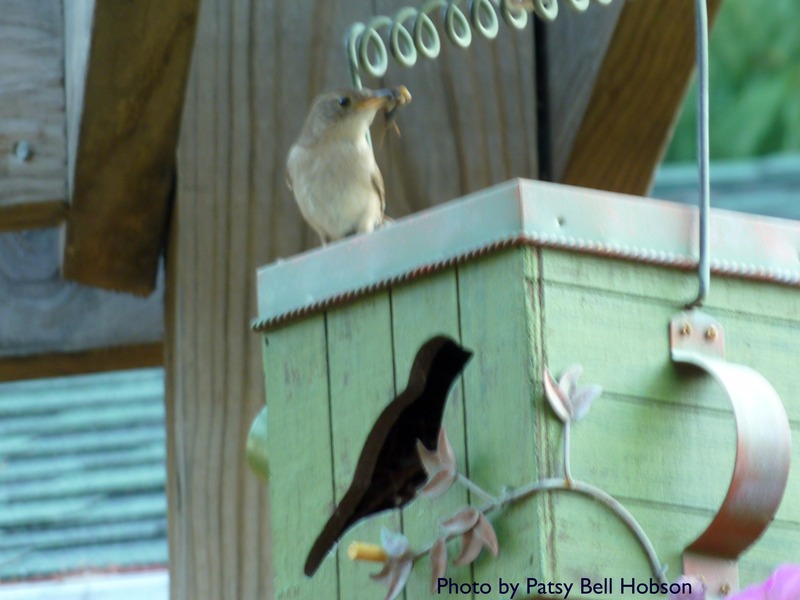 Even Patsy Bell Hobson did not kill it.” I don’t know if this is a regional marketing strategy or a National Campaign. Let me know if you see this tag in your store. The Supertunias® were regularly watered, but not fertilized.